Dr. Johnnie Coleman, the iconic Chicago minister who founded and built the Christ Universal Temple, for which she led for over 50 years, went home to be with the Lord on Tuesday, December 23, 2014. Homegoing Services are pending and will be announced on the church website, http://www.cutemple.org. On Tuesday, December 23rd, our beloved spiritual mother and founder, the Reverend Dr. Johnnie Colemon, made her transition. We lovingly hold her up in prayer as we release her into the grace, peace, and harmony of God’s presence. We are praying with her family and everyone who was touched by her life-transforming ministry. At this time, arrangements for a memorial service in her honor are incomplete. Additional information will be forthcoming as promptly as it is made available. 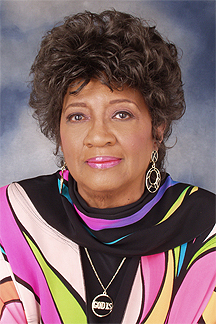 The Reverend Dr. Johnnie Colemon, often referred to as the First Lady of the New Thought Christian Community, founded Christ Universal Temple, a thriving, spirited, and progressive New Thought Church in 1956. In 1974, she established an international organization of affiliated New Thought churches and study groups called the Universal Foundation for Better Living. As a member of the International New Thought Alliance (I.N.T.A. ), Rev. Colemon served as the district president and the chairperson of the 60th I.N.T.A. Congress held in Chicago. “Johnnie”, as Rev. Colemon is affectionately called, celebrated fifty years of building and teaching in 2006, the year she retired as the Senior Minister of Christ Universal Temple. During her tenure, she built five structures to spread the “Better Living” teachings, including three churches and two institutions of learning (Johnnie Colemon Institute and Johnnie Colemon Academy). She also constructed a luxury banquet hall and restaurant in service to a community that, previously, had little access to a high end dining experience. The first church, built in 1962, was named Christ Unity Temple, with a its addition to accommodate another 1000 parishioners constructed in 1972. When the congregation outgrew the first church and the additional building, Rev. Colemon designed, constructed, and moved into the current Christ Universal Temple, located on the 100 acre campus at 119th Street and Ashland Avenue in Chicago. The Reverend Dr. Johnnie Colemon, founder-minister of Christ Universal Temple, has a message: “Teaching People How To Live Better Lives”. Often referred to as the first lady of America’s religious community, she is the pastor of the thriving, spirited and progressive New Thought Church, which has nearly 20,000 members. Born in Columbus, Mississippi, Colemon was raised in a rich spiritual environment. Her parents, John and Lula Haley, were active members of the church and encouraged their only child to participate. Colemon demonstrated leadership skills early at Union Academy High School, graduating as valedictorian of her class. She received her B.A. at Wiley College and first became a teacher for the Chicago Public Schools and later an analyst for the Quarter Masters. Open Your Mind and Be Healed is not only the title of her book, but her remarkable personal story of the use of universal principles of healing. After learning that she had an incurable disease in 1952, with encouragement from her mother, Colemon enrolled in the Unity School of Christianity, Lee’s Summit, Missouri, where she received her teaching certificate and became an ordained minister. Colemon is a builder and a teacher. She has built six structures to spread the better living teachings: three churches, two institutions of learning and a restaurant and banquet facility. The first church was Christ Unity Temple built in 1956 and its addition in 1973. The congregation expanded to the current Christ Universal Temple, located on the sprawling campus grounds at 119th Street (named Rev. Johnnie Colemon Drive in 1996) and Ashland Avenue in Chicago. Close to 4,000 people flock every Sunday and are taught how to think, rather than what to think. Her experiences compel her to share with others: “Change Your Thoughts and Change Your Life.” Out of a sense of knowing that a need for a vital, new affiliation of independent New Thought Churches existed, Colemon’s dynamic leadership led to the organization of the Universal Foundation for Better Living, Inc., an international association of New Thought Christian Churches and study groups located in the USA and abroad. Her civic positions include Director of the Chicago Port Authority and Commissioner of the Chicago Transit Authority Oversight Committee, recognition as one of Chicago’s Living Legends by the Institute for African American Youth Development. She was honored by DuSable Museum as an African American History Maker. Colemon is the recipient of numerous honors and awards. She holds the distinction of advancing the New Thought movement and received the Minister of the Century from the International New Thought Alliance (INTA). Colemon was awarded an honorary doctor of divinity degree from her alma mater, Wiley College in Wiley, Texas; the degrees of doctor of humane letters and doctor of divinity from Monrovia College, Liberia; and a Ph.D. in humane letters from Gospel Ministry Outreach (GMOR). Other honors include proclamations from the States of Illinois and Michigan; the City of Chicago; the Ohio House of Representatives; the Michigan Legislature; the City of Oakland, California; Miami, Florida and many others. Bishop Kenneth Lewis Tate, 54 of Huntsville, AL departed this life on December 16, 2014 at 9:34 am at his home surrounded by love. Bishop Tate was educated in the Madison County school system, and attended Alabama A&M University, Huntsville, AL. He received a Bachelor of Science Degree in Biblical Studies at American Baptist College, Nashville, TN. He retired from Redstone Arsenal as an Information Technology Specialist in 2004. Bishop Kenneth Tate was the establisher, and Senior Pastor of New Shiloh Church Ministries in Huntsville, Alabama, and the Third Presiding Bishop of Dominion Covenant Fellowship of Churches, International; headquartered in Detroit, Michigan. Bishop Tate leaves to mourn a wife, Cynthia Tate, Huntsville, AL; daughters, Angelia (Anthony) Huggins, Kenethia Tate, both of Huntsville, AL, son, Le’Quinton (Jimilee) Tate, Hazel Green, AL; mother, Alma J. Tate-Anderson, West Bloomfield, MI; father, Pastor Elijah (Lorine) Tate, Huntsville, AL; sister, Kabba Tate-Anderson, West Bloomfield; MI, four brothers, David (Valarie )Woods, Detroit, MI, Jarvis Tate, Huntsville, AL, Minister Christopher Tate, Johnson City, TN, Reverend Wayne Sibley, Huntsville, AL; step-sister, Alicia Burwell, Madison, AL, father and mother-in-law, Freddy and Vera Abernathy, Decatur, AL; three sisters-in-law, one brother-in-law, seven grandchildren, and a host of aunts, uncles, nieces, nephews, cousins and friends. 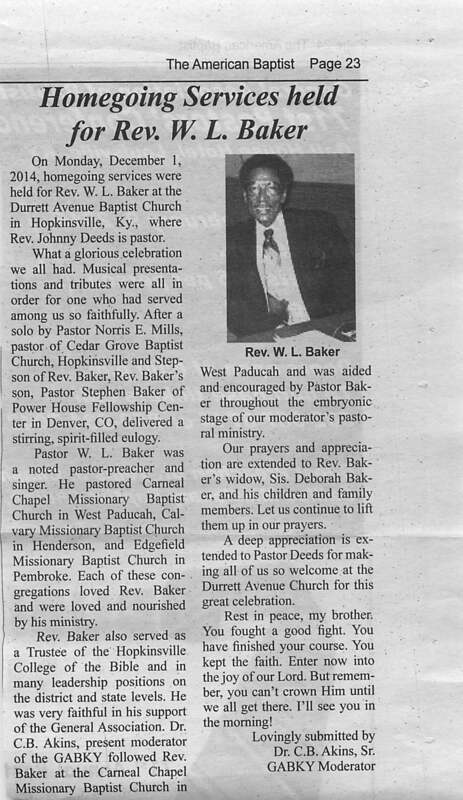 The Homegoing Services have been announced for Dr. John T. Teabout, Sr., pastor of the Greater Friendship Baptist Church Newark, NJ. Rev. Teabout went home to be with our Lord and Savior on Friday, December 19, 2014. Rev. Teabout has been a faithful part of the Late Night Services for the National Baptist Convention. Let’s pray for his family and his church family and the community of faith. “This movie was horrible” was the first thing that crossed my lips at the conclusion of the new movie “Exodus: Gods and Kings.” It seems like Hollywood is hell bent on using promising Biblical narratives (see: Noah) and then turning the story upside down. My problem (and I suspect the problem of many) will be if you have even a rudimentary knowledge of the story of Moses and the flight of the Hebrews from Egyptian captivity – what you see on the screen will not jive with the Biblical narrative. I too was distracted by the lack of people of color in the starring roles. It was like watching a high school production of “Purlie” and there were no black actors available. They seemed oddly out of place, pale, and spoke more European english than American english. The costumes were not strong enough to be convincing that there was a person of color shortage in Hollywood. The script is very loosely based on Biblical fact and unbelievable. First, Moses’ encounter with “God” is absolutely insane. According to the movie, Moses is rounding up three sheep on the side of a movie, for some unknown reason, in the midst of a driving rain storm and becomes the victim of a mudslide, which results in him being knocked unconscious. While unconscious, he wakes up engulfed in mud, and is face to face with “God” who is a small european descent child who allows Moses to argue back and forth with him. There is no “let my people go” and the “I am” phrase is uttered and then “God” disappears. Secondly, Moses’ encounter with Ramses is way off key. Instead of Moses killing an Egyptian for torturing a Hebrew, Moses is “outted” as a Hebrew by his sister and is reunited with his birth mother, at the insistence and persistence of Ramses’ mother. Their rivalry is strange as well, especially since Pharaoh is obviously a huge Moses fan, but has made it clear that his blessing is upon Ramses. Thirdly, the plagues were difficult to watch. Instead of confronting Ramses/new Pharaoh, “God” tells Moses “you won’t have to do a thing” which is not sensible or biblical. In the Bible, Moses and Ramses were confrontational. In this context, Moses sits on the sidelines while “God” sends plagues seemingly for no reason. The Nile River is turned to blood when “God” causes alligators to appear from the waters and attack a fishing vessel and then the alligators turn on each other and the Nile River is full of blood. The other plagues were interesting to watch but the reaction of Ramses and Egypt was strange. Fourthly, these slaves were not caught in the mechanics of slavery. They didn’t look that oppressed throughout the movie. I saw more oppression in “Twelve Years a Slave” than I did in this movie. When they left slavery in Egypt, it looked like they were packing up entire neighbors and a mass exodus looked like a mass gentrification. Fifthly, the Red Sea. Oh my friend – it ticked me off to see how this played out. Moses is scared of Ramses and he has a four day head start on their army. (By the way, Moses is a master military genius and in the movie, he trains the Hebrews (who are supposed to be in slavery) how to fight as marksmen). Moses decides to cut through the mountains which will slow the Egyptian armies because their vehicles and supplies can’t endure the slopes and hills. Oddly, Moses and “dem” make it through without few problems, but when Ramses and his boys come through, the whole hillside collapses, wiping out about a third of his army. Then they get to the Red Sea and Moses is waiting for “low tide” instead of a miracle from God. Not only that, the ground is noticeably wet and ponding, unlike the Biblical account that they crossed through the Red Sea “on dry ground.” When Ramses and his army shows up, the Red Sea all of a sudden raises up and kills the army, some Hebrews, and even Moses is caught up in the water but protected. This movie was terrible. If you want closer Biblical accuracy, rent or download “The Ten Commandments” or catch it this Easter on ABC. Otherwise, I recommend going to any other movie accept this one. This movie should die of gross neglect from the Christian community.